Worrying if you could reactivate your Facebook account after you may have deactivated it? Or you are concerned about the possibility of getting back a deactivated account. See: How to Temporarily Deactivate My Facebook Account. 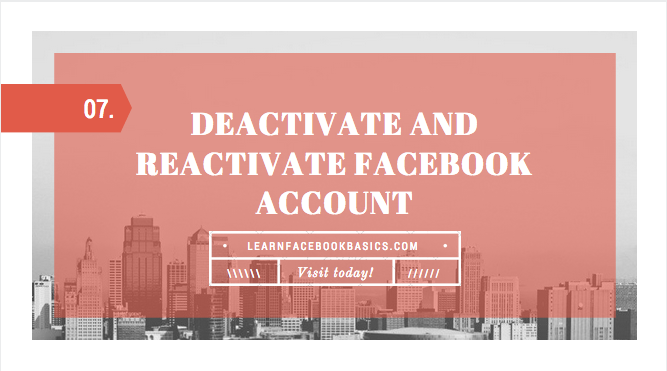 Do you really want to deactivate your Facebook account or just need to do some fine-tuning of Facebook privacy or better-still turn off Facebook notification that you don't like. Agreed!! Some notifications and updates are really energy-draining and if you really want to work at your peak, the best you can do is take a review of the notification you want to get update on. If you commented on someones post, consider turning notification off for that particular comment if you do not want to follow up. By default, Facebook will send you notification of whatever reaction takes place on that comment. Same goes to everything else on FB. Set your priority straight and you will not consider quitting. If you are leaving because of privacy, Facebook allows users to set privacy that protects their ID. You can also block stalkers, frenemies, annoying users, etc. I don't want to continue with Facebook - I want to remove my account? So you are totally done with Facebook for real, next thing to consider is if you want to permanently remove your account or just temporarily. If you choose permanently, you can not recover your account again, you can undo removal again. If you choose temporarily, then you are left with option of reactivating Facebook account whenever you want to. How can I reactivate my deactivated account? Once you login back to your Facebook account with your Facebook account correct email and password. You account is automatically reactivated. Please kindly share this article!